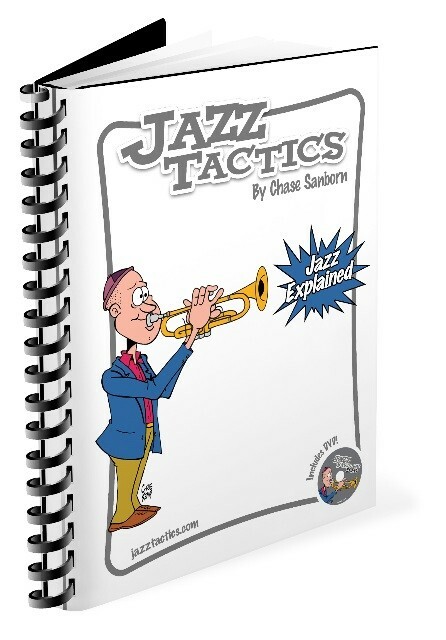 Jazz Tactics is comprised of a 240-page book and 100-minute DVD featuring trumpeter and author Chase Sanborn. Chase speaks with the insight of a life-long jazz musician, and teaches with clarity and a sense of humor. He tells you what you need to know, and shows you the simplest way to go about learning it. Jazz Tactics offers an approach to jazz improvisation that is both comprehensive and comprehensible. It provides information and tips for all instruments and all levels. Jazz will seem a lot less mysterious after you’ve read this book! The included Jazz Tactics DVD brings the written text to life, as the Chase Sanborn Quartet takes the viewer on a guided tour into the world of jazz music. With simple, clear explanations and musical examples, they show how musicians use the language of jazz to communicate. Special features include tips for the rhythm section and PDF files of all the musical examples, transposed for all instruments. Whether you are a student, teacher or jazz listener, you’ll gain insight into the process of improvisation and the mind of the jazz player. Jazz Tactics is a comprehensive resource for anyone wishing to expand his or her understanding of jazz music. As you read the book and watch the DVD, many things will become clear. You’ll find yourself asking “Why didn’t anybody explain it like this before?” You’ll be entertained, you’ll be enlightened, and you’ll come away with a greater understanding and appreciation for jazz music and jazz musicians. Would you like to become a more well-rounded, efficient brass player? Would you like to develop a rich vibrant tone? Would you like to have clean, crisp technique? Would you like more endurance? Would you like a stronger and more consistent high range? Would you like to know more about mouthpieces, shakes, vibrato, mutes, lead trumpet, sight reading, kacks and clams? With 220 pages of written instruction and over two-and-a-half hours of audio/video instruction, Brass Tactics will answer every question you have about owning and operating a brass instrument. Author and jazz trumpeter Chase Sanborn combines real-world advice with a sense of humor, speaking directly to the reader with a friendly and accessible style that has created fans around the world. 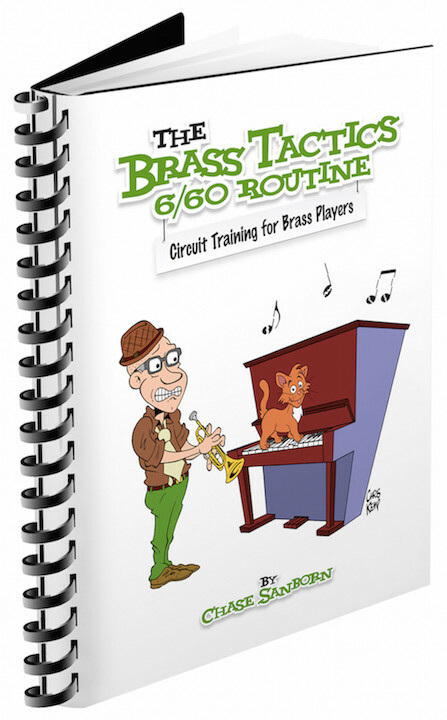 Whether you are a professional, student, hobbyist or comeback player, Brass Tactics will help you reach your goals. You will learn what, when and how to practice, and will gain valuable insight into the world of the modern brass player. You will learn how to put together a comprehensive and efficient practice routine that addresses all aspects of playing a brass instrument. You will learn about equipment, gigs, teaching, lead playing and many other important yet rarely-discussed aspects of the brass player’s musical life. Brass Tactics comes complete with an accompanying CD and DVD. 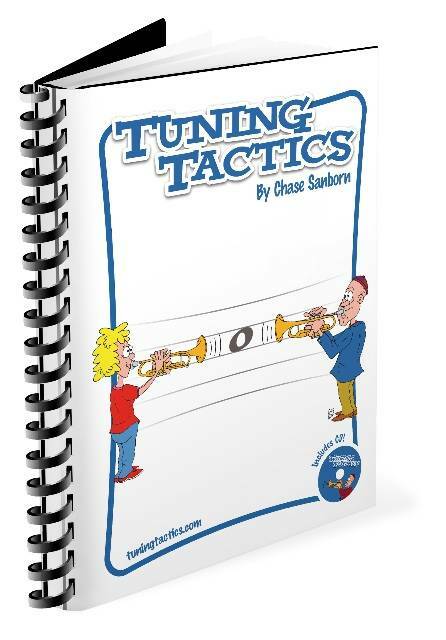 On the Brass Tactics CD, Chase Sanborn discusses and demonstrates all the exercises that are presented in the book. Hearing the exercises played is vitally important in understanding how they should be approached, and helps the player develop a sound model to emulate. Every musician deals with the challenge of playing in tune. Tuning Tactics offers information, advice and exercises to help you understand the art and the science of intonation. The included Tuning Tactics CD offers 88 demonstration and play-along tracks which will dramatically improve your ability to hear and control tiny changes in pitch. You’ll develop an intuitive sense of where to place each note, based on its position in the harmonic structure, and you’ll become familiar with the intonation tendencies of every note on your instrument. Tuning Tactics is suitable and beneficial for all instrumentalists and vocalists, at every level from beginner to pro. It’s never too early–or too late–to improve your sense of pitch!